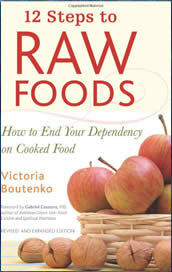 12 Steps to Raw Foods: How to End Your Dependency on Cooked Food is written by Victoria Boutenko. In 1993 Boutenko and her family were all experiencing serious health problems ranging from asthma and diabetes to cardiac arrhythmia. Due to her concern about the side effects of pharmaceutical medications Boutenko began to search for natural solutions. She learned about the raw food diet and she and her family started eating this way practically overnight. Almost immediately they noticed their health issues improved and after four months on the diet they all completed a ten-kilometer run. Boutenko wrote this book to help readers to avoid the pitfalls of adjusting to a raw food diet as well as to maintain this way of eating as a long-term lifestyle. The diet that Boutenko recommends consists only of plant-based foods that have not been cooked or processed. The diet will include primarily fruit and vegetables with small amounts of nuts and seeds. 12 Steps to Raw Foods is known for introducing green smoothies to the general population, which are a blended combination of fruit and leafy green vegetables. She advocates the inclusion of green smoothies in the diet every day for their high content of protein and minerals, which are important for maintaining long-term health on a raw vegan diet. Boutenko emphasizes the point that each person requires a different diet and she advises us to pay attention to cravings for natural healthy foods. Conversely she says that cravings for cooked foods are more likely to be related to their addictive nature rather than a true biological need. She created a 12-step to raw foods program to help people overcome their addiction to cooked foods so that they will be able to successfully sustain a raw food diet. Fruits, vegetables, green smoothies, raw nuts and seeds, avocado, durian, coconut. 12 Steps to Raw Food recommends exercise, especially walking, as an effective natural way of managing stress. Boutenko says that doing some form of exercise or intense physical activity for at least thirty minutes each day will provide a wide range of benefits including increased energy, improved metabolism, better self-esteem, less body fat and a reduced risk of many serious diseases including cancer, heart disease and osteoporosis. 12 Steps to Raw Foods: How to End Your Dependency on Cooked Food retails at $16.95. Encourages the intake of fruits, vegetables and healthy fats. May assist with the management of a wide variety of health problems. Will reduce the risk of developing chronic diseases such as heart disease, diabetes and cancer. Can help dieters to overcome compulsive eating. Acknowledges the importance of exercise, sleep and stress management for good health. Includes tips for eating a raw food diet on a budget. Can be difficult to eat out and in social situations. Dieters may experience discomfort during the initial transition period. Necessary to plan the diet carefully or take supplements so as to avoid potential nutritional deficiencies such as vitamin B12, zinc, selenium and protein. Boutenko offers dieters practical tips, recipes, and strategies and supports her recommendations with real-life experience as well as scientific research. 12 Steps to Raw Foods will appeal to dieters who would like to start a raw food diet as well as those that have tried this way of eating in the past but have had difficulty sticking to it over the long-term.